pastry bag and a star shaped tube. Terrance Scully, author/translator of many medieval and Renaissance cookbooks writes in The Art of Cookery in the Middle Ages, "Every major recipe collection of Medieval Europe is absolutely bound to contain, somewhere between its first and last pages, directions for at least a dish or two called either a crisp (or crépe or crispello) or a doughnut. The procedure involved in making either of theses is quite simple. All that is needed is, on the one hand, hot grease in a pan or a pot and, on the other, a dough or batter to drop into it." 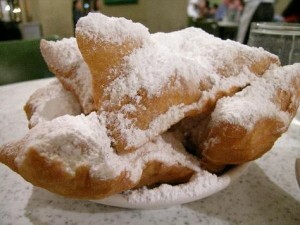 And what better way is there to break Lent than with a beautiful, puffy, fried treat known as a beignet. Beignet, (pronounced Ben*YAY) a French word for fried dough or fritter, comes from the same original word that turned into bun in England, bugne in Belgium, and buñuelo in Spain. Beignets are usually made with an unleavened, hot water paste, but recipes also exist for beignets made with yeast dough that are related to raised doughnuts, sopapilla, Berliners, and funnel cakes. They were associated with Carnival season before Lent and after Easter. In 16th century England, these fried cakes were called Bennets. They were called spritz kueken and krullers in Germany, and zeppole in Italy. The first recipe below, from A Book of Cookrye published in London in 1584, is basically made by frying the same kind of hot water paste that is used to make baked treats like cream puffs, eclairs, and profiteroles. This kind of hot water paste is now called Choux (French for cabbage) paste because of the shape of the little buns it makes when baked, but it didn't get that name until the 18th century. Prior to that it went by other names and was used in various recipes like buñuelos de jeringa, in Spain meaning "syringed fritters" and pets de nonne meaning "nuns farts" in France. This hot water paste is said to have been invented by Chef Panterelli for Catherine de Medici in 1540. However, authors during this time, were prone to claim credit for techniques that they had learned elsewhere and introduced at court, so this pastry probably had an earlier origin. There was a 14th-century French treat called pets d'Espange or "Spanish farts" that predates Panterelli by 200 years and some food historians point to similar recipes as far back as Apicius in ancient Rome. Bartolomeo Scappi, head chef to Pope Pius IV, described a similar dish simply called "fritters" that was squeezed through a syringe or rolled out and cut with a small round tube of metal or the mouth of a carafe dipped in oil. The syringe (see picture) was a cylinder made of brass with a plunger that forced the dough through a star shaped opening in the end. Today you can find a similar instrument called an electric "cookie press" or, for something that more closely resembles a Renaissance syringe, a metal "cake decorator" can be bought wherever kitchen tools are sold. I find that a cloth pasty bag fitted with a star tube is easy to use and holds more paste than a syringe. 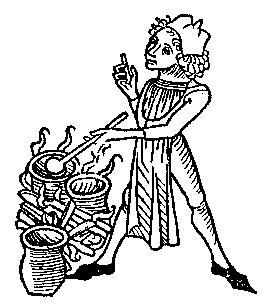 Cook attending his pots from a Medieval woodcut. Put butter and water over the fier in a faire pain, and when it boyleth put therto fine Flower and Salte, and so let them boyle, but stir them well for brenning, and when it is wel thick, put it into an earthen pan, then break Egs into it and boyle them so togither, than boyle a good quantitye of Butter clarified over the fire, and with a spoone put in your other stuffe and so frye them till they be browne, and that doone, serve them foorth with Sugar on them. *The original recipe calls for frying in clarified butter but I prefer oil or shortening. Rendered pork fat (lard) was also used in period to fry dough and can be used as a butter substitute. In a heavy 2-quart saucepan, combine sugar, salt, butter, and 1 cup water. Bring to a full boil. Remove from the heat and quickly add the flour all at once. Beat in the flour with a wooden spoon until it is all incorporated. Return the pan to the stove over medium heat, beating vigorously until the paste forms a ball and leaves the sides of pan. Remove from heat. Transfer the mixture to a mixing bowl. Allow to cool for 5 minutes. Add the whole eggs, one at a time, beating with an electric mixer at medium speed after each addition. (You can use a wooden spoon but it is very hard on the arm.) Continue beating until the mixture is smooth, shiny and satiny and forms strands that break apart. The dough should hold its shape and be fairly stiff. Set the dough aside to rest while you heat the oil. Heat 1 to 2-inches of oil to 370°F (185°C) in an electric skillet or large, heavy fry pan. 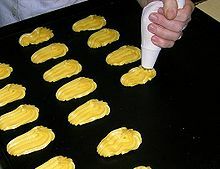 Using a pastry bag or a syringe, squeeze out pieces of dough 4 inches long on a piece of parchment and transfer them to the oil with a spatula (do not crowd skillet). You can also squeeze them right into the hot oil to make churros. If you use a star tip and make rings of dough and fry them, they are called crullers. Crullers are usually iced while beignets are garnished with powdered sugar and churros are garnished with granulated sugar and cinnamon. Fry 3 or 4 at a time until puffy and golden brown on both sides. Remove beignets with a slotted spoon and drain on paper towels; transfer to a wire rack over a sheet of wax paper. While hot, sprinkle generously with powdered sugar and transfer to a warm platter. Keep warm in 225°F (105°C) oven as you continue frying the remainder. Serve hot with more sugar. Makes 16 servings. Monde in New Orleans, LA. Heat milk, salt, and butter until the butter melts. Remove from the heat and allow to cool to wrist temperature. Dissolve yeast in the liquid. Let stand for 15 minutes. Add part of the flour and mix vigorously for 2 minutes. Add the egg and mix again. Add 1 cup of flour and mix until smooth. Turn out onto a floured board and knead for 15 minutes until the dough is smooth and elastic. Place in a greased bowl and cover with plastic wrap or a damp cloth. Place in a warm place and allow to rise until doubled in bulk, 1½ to 2 hours. Punch down. Roll out the dough on a floured surface to ¼ inch thickness. Cut into palm-sized rectangles and let them rise under a dry cloth for about 1 hour. Heat 2 inches of oil or lard in a large skillet. Bring it up to 350° on a deep fry thermometer or test it by seeing if a cube of bread browns in 1 minute. Fry only few at a time so they don't crowd each other and stick together. Turn them over after 2 minutes and cook until brown on both sides. Remove with a slotted spoon to a plate lined with absorbent paper. Sprinkle with lots of powdered sugar before serving. To make sopapilla: Fry in lard and serve with honey instead of powdered sugar. To make Berliners: Stuff the fried pastry with fruit filling and ice with a powdered sugar glaze. To make Mistembec or funnel cake: Right after you knead the dough, mix in tepid water until you make a batter that has the consistency of thick porridge. Heat the oil to 375-400°F in a small sauce pan. The period cookbook says to put the batter in a bowl with holes in the bottom the size of lentils and push (or drizzle) the batter through the holes into the pan of hot oil, however I find using a large funnel works better. Use a round dowel or wooden spoon handle as a plunger to block the funnel hole and control the flow of the batter. You can also use a measuring cup with a spout or a teapot. Drizzle swirls and loops of batter to fill the surface of the saucepan. When brown and crisp on the bottom, use two wooden skewers or chopsticks to turn it and brown the other side. When done remove the funnel cake and drain it on absorbent paper towels. Prior to serving dip it briefly in a hot syrup of honey and sugar. Serve warm. This is the easiest way to make beignets while camping. Thaw the puff pastry and bring to room temperature then unroll. Cut into 4-inch squares. Cut each square with an "X" on the diagonals to make 4 triangles. Fry in oil until browned. Drain on paper towels and dust both sides with powdered sugar. Serve immediately. If you want to add this article to your list of favorites or email it to a friend, please use this permanent URL, https://stores.renstore.com/-strse-template/1004A/Page.bok. Permission is granted by the author to quote from this page or use it in handouts as long as you include a link back to Renstore.com.